BP CHIEF executive Bob Dudley said there was a need for realistic patience after the oil and gas giant struggled to impress investors with its long-term plans yesterday. Announcing the firm’s second-quarter results, Mr Dudley said BP was now on stable ground and focused on growing safety, trust and long-term value, one year on from capping the Macondo well in the Gulf of Mexico, following the Deepwater Horizon disaster. Pre-tax profits for the second quarter were £5.3billion, compared with £6.8billion in the first and a loss of £14.9billion in the same period in 2010 as it reeled from the costs of the US oilspill. Revenue also rose from £52.1billion in the first quarter to £61.9billion in the three months to the end of June, reflecting higher oil prices, despite an 11% dip in production, described as a result of the slowdown in activity in the Gulf of Mexico plus maintenance work in Angola and the North Sea. The results came in below market predictions, however, and shares in BP, still significantly lower than pre-Macondo, fell 2.6% to 463.3p. Some analysts have called for BP to consider a break-up similar to a move by ConocoPhillips to split its refining and upstream businesses. JPMorgan Cazenove said recently that splitting up the company could unlock as much as £60billion for investors because BP’s market value did not reflect the worth of its individual assets. Mr Dudley said: “It is worth reflecting where we were a year ago, when people were questioning our very existence. 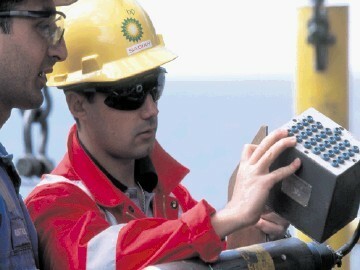 BP is a company that is changing rapidly. “Having stabilised the company while living up to our commitments in the US, we will now increase our focus on performance and long-term value creation. BP said it had sold £15billion of assets as part of its £18billion divestment aim for the end of 2011 in the wake of Macondo. It said nine new projects were expected to come on stream in 2012 and 2013, most in higher-margin areas such as Angola, the North Sea and Gulf of Mexico.